I had to move the wine out of our wine closet to give access to a home inspector. In the past year, our wine inventory has not varied from between 100-120 bottles. This is despite good-faith efforts to drink more wine and buy less. Of the wine, at least 75% of it is from local wineries. We have our favorites, as well as exploring new wineries and buying a couple of bottles when we find something we like. We attended the annual Harvest Soiree at De Ponte Cellars in Dundee, Oregon. I hesitate to ever mention this winery because I love their pinot noir so much. I don’t want others to know about it. It is a private event limited to those who have purchased at least a case of their wine in the past. 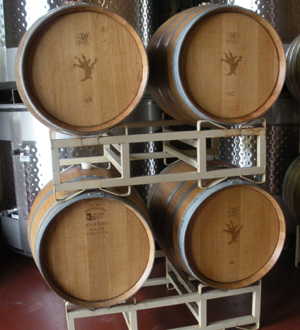 We have been buying a case of their Dundee Hills Pinot Noir each year since the 2003 vintage. It usually has strong notes of cherry and red fruit with a vanilla note. Usually the Baldwin Family Reserve Pinot Noir is not to our taste. However, something flip flopped with the 2006 vintage. The less expensive Dundee Hills has a nice raspberry note, but no cherry notes and a Robert Parker rating of 91. The Baldwin Family Reserve, at twice the price, has the lovely cherry notes we enjoy and a Robert Parker rating of 92. In tough economic times, what to do? Don’t lay in a case at all? Buy the less expensive case knowing you won’t enjoy it as much? Buy only a half case of the more expensive swill? Bite the bullet so you won’t have any regrets in 2012? After trying both a second time, I decided I had enough in the checking account to get a full case of the spendy stuff I know I will enjoy. The tasting room was packed with people (including a former Oregon Secretary of State) and cars were parked all the way down the long drive. But despite it looking like they had enough customers, I got a very sincere thank-you from the gal behind the wine counter, who then lugged the case to our car. I was impressed with the sincerity. I want to keep this winery in business, so that made me feel even better about the more expensive purchase. I enjoy the Harvest Soiree free barbecue buffet. The food was very good, although Maysara has them beat. We’ll be visiting Maysara on Thanksgiving weekend.